Unsuccessful in my first attempt at London ballot, which is a relief! Think another year of building up stamina is needed before I go for the full 26.2. Hello. Day2 of streak. Last night 7.9miles through town centre in 59mins. Many fellow headtorch running folk about. Big organised pub crawl going on. Happened across them early when they were relatively sober and friendly. Today about 11.9miles half offroad. It was rubbish. Felt like I was running in treacle. Didn't take the route intended as would have been too far. Split run into three with brief breaks. Not really slow but laboured and heavy. Not sure what was wrong. Frankly I'm not much enjoying longer runs either physically or mentally. Maybe it's all in the head. Hope you feel better, Andrea. Great running, Hazelnut, Swittle, Snewma and Jimbob! Good luck with Birmingham. There must have been a rare Un about, Hazelnut. Best birds for me yesterday were 2 Great Skuas - the pirates of the sea. I needed a decent run on the trails this morning. Stressful times at school and again I despair at the pressure and expectations staff are put under. The rewards once more are not equal to the crap you have to put up with from above and from some parents. Not good. Anyway, it was nice and fresh this morn, with a pleasant drizzle. I had a bit of a strange thing going on with my eyes afte 2 miles. Kind of neon halos that wouldn't go away with blinking and felt a bit weird. Most probably stress related. After a few minutes that cleared up and I made my way into the woods, whereupon I got completely lost and went round in circles for some time before I found my way out! Eventually found the lake for a few nice laps. Prehistoric looking Grey Herons were mobbed by Gulls, Cetti's Warblers shrieked and saw a couple of lovely GS Woodpeckers and a fresh in Song Thrush. Finished on a couple of hills and with a couple of my legendary spurts. 7 and a bit miles in 1h 09mins. Sounds like a lovely run Will. Great nature spots and therapeutic too- ideal. I too did a therapeutic 4 miles this morning, on rather dull roads, easy paced. Really felt I needed it. Tomorrow I'm the 2.15 pacer at the Race for Life half marathon, which should be really fun and a lovely easy training run to boot. Thanks, Nessie - 'tis an everyday thing! You're 30 mins earlier than me for the morning run. Hope pacing goes well. I think I'd find that a heavy responsibility. Will - London and hundreds of other Marathons will be waiting for you. Good plan to build up. Mull sounds ace. Description of bird life on the lake = even better! Streak on, JT. Just a thought: try long intervals, say, 3 x 3 miles, at different paces, 5 min walking recovery. Nessie, good luck with the half. I dragged myself to my 94th after doing nothing all week due to a horrible cold. Somehow managed a 24:24, although I think Night Nurse saytime tablets were responsible due to the caffeine they contain. last week after not being picked for a class play- his main gripe is that their are two boys who are always favoured... and I have to admit, he has a bloody point, Its horrible to admit but there is blatant favouritism going on. Hey folks, I've not posted here for a bit on account of the fact I've not been able to run, but I did manage to walk Royal Parks today. First walking half marathon! I still felt a need to push myself and somehow managed to walk it in under 3 hours despite a frankly painful lower back, grumbling hip and groin. A personal worst by a long way, but I feel rather pleased with my walking performance. No regrets! I think that's a great time for walking Cal. Sorry to hear about your pain. I sniffed some sudafed nasal spray and did a slow four miles this afternoon. Great effort, Cal! Hoping your aches and pains say cheerio soon. To keep my mind off the looming Monday gloom, I just went for a 9.5 mile LSR. A little bit achey as I also did some miles yesterday, but kept it steady and road tested my new bottle belt/fanny pack. The Norfolk Coastal Half is mostly self navigated, with a lack of water stops, so I'll need to carry fluid and my phone. It felt a bit bulky to start, but soon enough I forgot it was there. I think I looked a bit of a nob, but taking some water on board, even for just 9 miles, felt good and I think helped my energy levels. Plenty of room for jelly beans too. Back to the grind in the morning. Boo! Sorry to hear of the continuing issues Cal but sooner or later things will improve surely!? Hazel, I'm no nearer being fit so I can't be sure I'll start Frankfurt but I'll probably make it. Yesterday was a rather unique day of running as I had rested for a couple of weeks and felt a lot better (but not fully healed) but with Frankfurt marathon in mind I knew I needed to get a proper long run in my legs but I was also entered in an eight mile race. The plan was to run 8-10 miles then do the race and then run 3 miles home and that's how things panned out. All in all it was 20 miles in almost exactly 3 hours of running but the aggregate time was around 3.20 which was pretty good I felt. As for the injury I've simply set the clock back to where I was two weeks ago so by the time the Great South comes along in a fortnight I'll feel fine and ten miles shouldn't cause any problems and then Frankfurt is a week later. After that all I have is a small local race at the end of November but I'll probably pass on that and just put running on the back burner until I feel I'm ready to run (even short distances) without any problems. 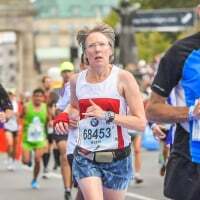 It's all very similar to 2016 when I struggled for a while and just about managed an overseas marathon before resting for a couple of months after which I was again. It's frustrating but it isn't the end of the world! That's good news, Matt, that you managed 20 miles. Hopefully you'll be recovered for the Great South. I've been to the doctor today as I have some swollen lymph nodes in my groin and it's worrying me. I can't help but think that, the sore hip and lower back are connected. I had some blood tests and should know more on Thursday but yeah, can't say I'm not concerned. Hope your cold is much better by now Andrea. Another good race report Jimbo. Enjoy being back in the UK for Birmingham! Sorry to hear about your school stress Will. Hope you can have a good break over half term. Cal I hope you have good news from the doctors. Well done for doing the Royal Parks - that was quick walking. Matt your 20 miles were faster than my 35km I think: I got round those in 3:19. The last few days I have been struggling to combine holiday activities with getting out for enough pre marathon quality runs. Luxury problems I know. A 56km mountain bike tour on Wednesday followed by a tough mountain hike on Thursday gave me a pretty awful dose of DOMS for any activities involving walking downstairs or downhills for a couple of days. Gentle running was actually less painful than walking (different muscles I guess). Will be more careful this week as I am running in a half on Saturday. I am planning to do that at marathon rather than HM pace. I'm another London ballot reject - will have a look for alternatives post Frankfurt. Seems to be an 'illness' time of year - even I have resorted to the handkerchief on a couple of occasions. Although I run every day, I'm still in admiration of people here who get the miles in when they are not 100%. No names but it's just about everyone! Cal, your 'walked' HM impressed me; hoping you're feeling better soon. Will, after 37 years' teaching, every day is still full of new stuff - whether I want it is a matter of conjecture. Those DOMS are no fun at all, are they, Hazel. Good variety of training. Here: 10.5 mile darkrun round Crosby & Waterloo last night: still, silent, almost deserted - no-one to see me hoiked up by a malevolent root. Minor grazes. 3-mile recovery at 7am today. 12miles on/off-road mix yesterday. Went okay. Stop/start with all the countryside obstacles to negotiate, but no breaks. Ran through fields of cows, sheep, horses. Passed a farmhouse with potbellied pigs in the garden. Good walking, running, falling being done. Cal- very well done for an impressive walking time and I hope the tests are clear. The Race for Life half was really fun and I think I enjoy pacing more than racing :-) It was hard sticking to a pace that was slower than my usual LSR pace, especially as mile 11 measured just 0.7 miles- which led to a dilemma of whether to stick to the planned pace or slow right down... But it was really satisfying helping others achieve their goals. I met some really nice women and had a gentle and pleasant run around Lee Vally park. I hope I can do it again. Fingers crossed Cal that the test results will be clear. Some really good long runs going on- I haven't done anything over 6 miles for a long time. I'm still feeling a little stuffy with a bit of an achey head mixed in. Managed a slow 3 miler this morning. I was thinking about doing the local half marathon on the 29th, but I can say with certainty that I'm not at that level right now. I had high hopes for my running in 2017, sadly not to be. I did achieve my 5k pb (22:57) in April but shortly afterwards came down with tonsillitis- it's been a constant struggle with ear, nose and throat ever since! Prematurely hoping that 2018 will be better! I get you, Andrea. I did amazingly until April, then it was one thing after another. Let's hope that we both get back to where we should be. A lack-lustre, low energy 4 miles this evening. Still enjoyed it, but it's that time of year isn't it? Pas de va-va voom ici. Welcome, LittleRache, and congratulations on completing your HM. Hey all. Got the blood test results this morning. Slightly low white cell count but otherwise all normal. Had the exact same thing when I got run down 10 years ago - felt terrible but there wasn't anything much wrong. Doc said I should get more tests done in a few weeks if I'm still not right. At the moment, back pain and the dodgy hip are stopping me running. I'm doing some yoga but the last couple of sessions have been tough due to the back. It's not a disc issue so not quite sure why it's not getting better. Bleh. Glad to hear that it is nothing worse Cal, you have enough to cope with already I think. Give yourself plenty of time to recover. Forgot to post yesterday. I did 5 steady miles. Rest day today. Hope your progression run went well Nessie. Not been running as much as I would like to have done during this second week of my hols but I have been doing other stuff instead (walking, cycling..). 653 days, eight squared years and still no idea. Good luck with the half tomorrow Hazel! You are the king streaker, Swittle! That really is impressive commitment. Great news, Cal. The law of averages dictates that you're due a dose of luck when it comes to injuries, so don't despair. Good luck with the marathon prep, Hazel. I can only dream about those HM times. I need to clock some miles this weekend as very busy next week and then off wild camping on Mull for 6 days from Friday (best place in the world). I will be doing a Munro up there and may squeeze a couple of short beach runs, but the order of the day will be Dawn to dusk birding, so a nice natural taper for my next HM. I did a nice 7 miles last night at a half decent pace. Breathing was good and legs felt really solid. Also, have cheered my arse up Can't let the (complete as appropriate) get you down. Up the workers! Amazing HM times Hazel! Hope it goes well.